Conditions: Strong northerly wind, turning westerly to south westerly later in the morning, high temperatures (44 showing on the bike computer at one stage – discounted due to being in the sun). Gusts to 90kph with the wind change. Would you cycle in these conditions? Four hardy souls, John H (GTC), John M, Tim W and Helen from Cycling Geelong, chose to do so. This was actually one of the rare occasions when one could take advantage of the wind. Time it right and there’s a tail wind all the way! 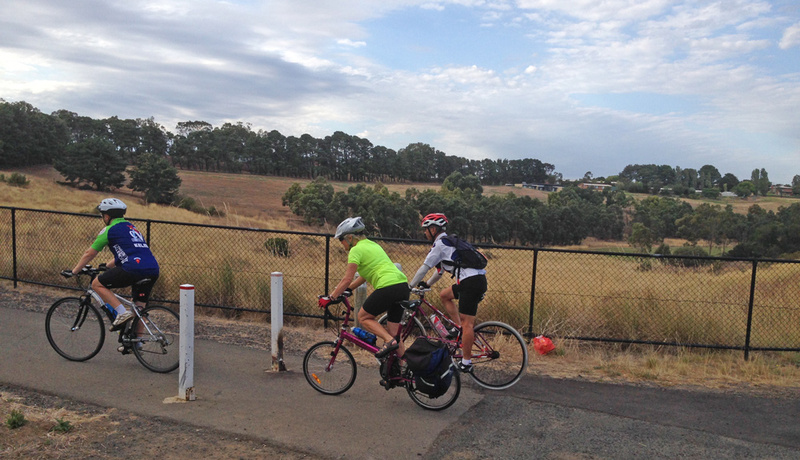 Setting off from South Geelong station the river path took the cyclists to Shannon Avenue Bridge and Barrabool Road. Turning west, to Scenic Road, then south to join up with Wandana Heights Drive. This was new territory to the Cycling Geelong riders. The road is smooth, interesting and quiet. 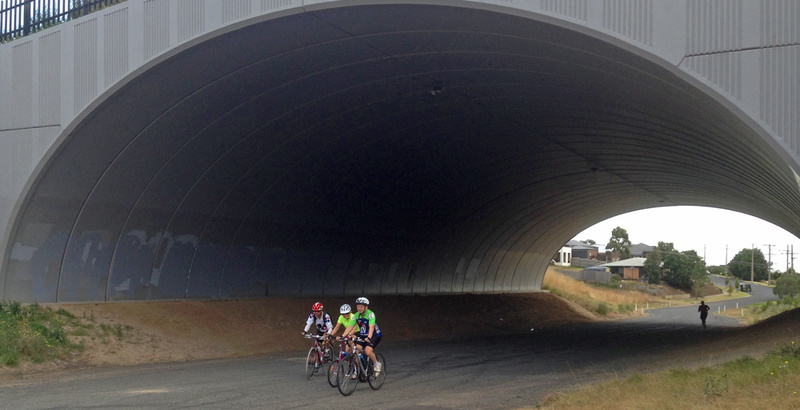 After negotiating the tunnel under the freeway, they were soon onto the continuation of the Ted Wilson Trail to the south and Pigdons Road, then on to the Ring Road bike path to Anglesea Road. A couple of little inclines and a lovely tail wind, with speeds of 50kph along Pigdons Road. Despite wind-blown debris on the Ring Road path, and the usual screenings, glass and debris on the bike lanes, it was an easy ride to the coffee stop at Freshwater Creek. Discussions of cyclist marathons – Mallee Routes and the Oppy soon had the riders discussing nutrition and keeping up the food intake. According to John, ‘half a white bread jam sandwich an hour’ is the correct fuel for these longer adventures. There was also a mention of ‘No Doze’. The wind swirled around the picnic table – more westerly than northerly. Indeed, but the time the riders had turned for home up Ghazeepore Road, there was no northerly at all. The wind was due west, and soon this included a little southerly. Whites Road to Surfcoast Highway was ‘cyclist heaven’ – tail wind, quiet road, slight downhill, and hot mix. However, there needs to be a gravel bit on just to keep us all honest, so John chose Burvilles Road which runs from the Surfcoast Highway to Horseshoe Bend Road. Alas, the gravel was completely corrugated. Never without a solution, John turned north along the much better surface on Barwarre Road to Boundary Road and east to Horseshoe Bend Road. It’s all easy with a tail wind, even though there was little or no change of temperature. The cyclists were soon spinning around the river path again from the Breakwater to Swanston Street and South Geelong car park. Thanks to John Hagan for leading the ride, and the intrepid and wise cyclists who choose to take advantage of the tail wind. This entry was posted in Ride reports and tagged Freshwater Creek Cakes, Ted Wilson Trail by hlyth2013. Bookmark the permalink.